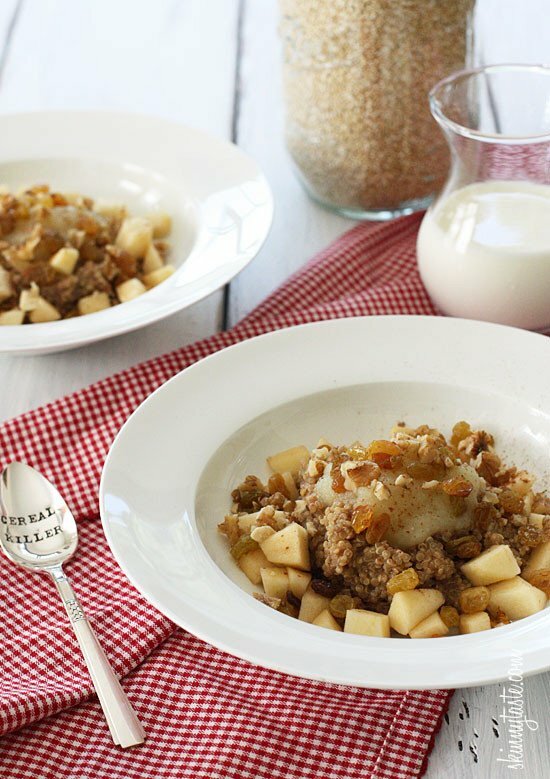 Apple cinnamon breakfast quinoa – quinoa for breakfast you ask? 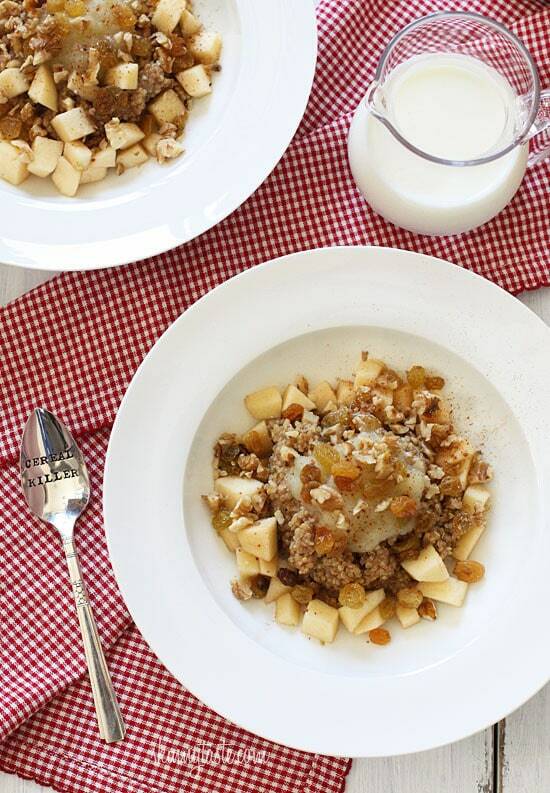 Well yes, quinoa served warm, with it’s nutty taste and chewy texture, pairs beautifully with fresh crisp autumn apples, golden raisins, pecans, warm milk, vanilla and cinnamon – a delightful breakfast that is both protein packed and comforting. You can do so much with quinoa as a breakfast like combining other fruits such as my Peaches and Berries Breakfast Quinoa Bowls, or festive with fall Pumpkin Spice Quinoa Breakfast Cookies. I also love a savory Quinoa Huevos Rancheros Bowl or Protein Egg and Quinoa Salad Jars for on the go. I just love the flavor sensations from each spoonful – the sweetness of the raisins, the pop from the quinoa, and the crunch of the apple and pecans. Fresh pears and cranberries would also make a wonderful alternative to apples and raisins. If you like your cereal a little sweeter you can drizzle it with a teaspoon of honey just before eating. One bowl will keep you fueled and satisfied until lunch. Quinoa (pronounced keen-wah) is a hunger-curbing and power-packed nutritional all-star. Loaded with satiating protein (8 grams per cup) and filling fiber (5 grams per cup), this superfood digests slowly, which keeps blood sugar and insulin levels steady. You’ll also get impressive doses of doses of thiamin, vitamin B6, folate, zinc, potassium, magnesium and selenium, along with 15 percent of your daily iron needs. No wonder the ancient Incas, who considered the crop sacred, referred to quinoa as the mother of all grains! 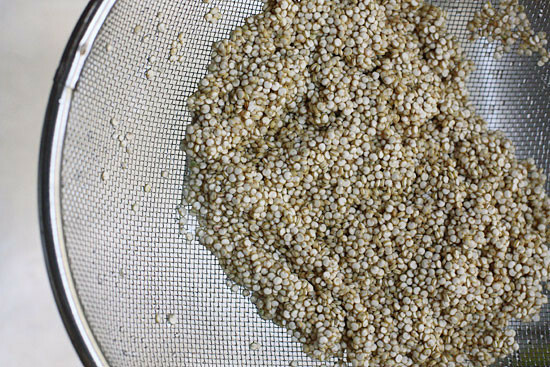 Be sure to rinse the quinoa well before cooking to rinse off the saponins which has a slightly bitter flavor, or you can buy it pre-rinsed. I like to warm my milk up, then pour it in right before serving. Enjoy! Combine quinoa, water, cinnamon and vanilla in a small saucepan and bring to a boil. Reduce to a simmer, cover, and let cook for 15 minutes until quinoa can be fluffed with a fork. 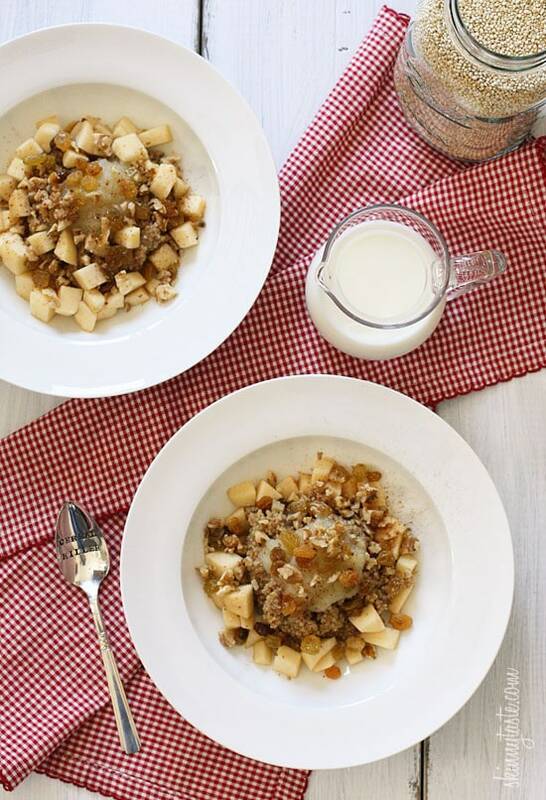 Divide cooked quinoa between four bowls then stir in apple sauce, raisins, and pour in warmed milk. Top with fresh cut apples and pecans and a dash of cinnamon. Makes 4 servings. You can divide the recipe to make 2 servings. **Nutritional information for quinoa provided by Heather K Jones, RD (aka The Diet P.I.). This was so good, a nice change from oatmeal! The only thing I did differently was to use a honeycrisp apple since it is my favorite. 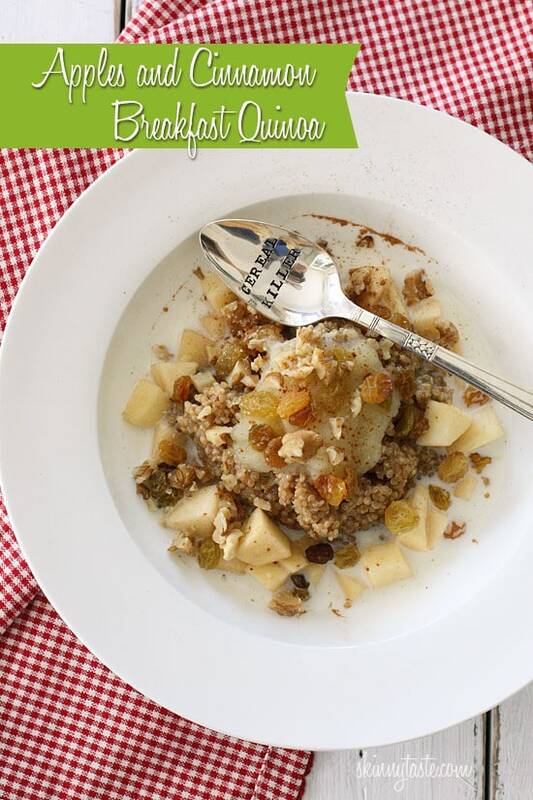 I enjoyed the nutty flavor and texture of the quinoa, and the raisins were great with the apple flavors. Had no trouble reheating for breakfast the next day. A make again recipe! Made and reviewed for the Alphabet recipe tag game. This sounds and looks good…but most of all, I love the spoon! Cooked it this morning for the entire family; we all loved it!!! Thank you! Wonder if I could substitute dried cranberries (craisins) for the raisins? Hi, I know most of the post on here are much older but for those reading after this post I measured this after cooking and got almost 4 cups. Gina This is very good. I fixed some today to have for the next few days and realized I didn't have apple sauce and not wanting to open a jar of homemade pear honey or spice plum jam I added a tip of a spoon of peanut butter and the raisins and milk. I only ate 1/4 cup just to sample it tonight. So this could be fixed with what ever flavor tickled your fancy. OMG, it has a lot of carbs. I have some already cooked quinoa in my fridge from another recipe and I was wondering what the measurement would be if I used already cooked quinoa? Does one cup of uncooked equal 4 cups cooked? I think I read that somewhere lol. 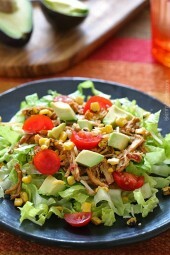 I was looking for a way to use up my leftovers…this looks so yummy!! So if each serving has 3/4 c quinoa, then this recipe would be 5 points per serving, wouldn't it? Not including the milk. Does 1 cup of dry quinoa make 3 cups cooked in this recipe?? This was absolutely delicious. I'm the only one in my house that eats quinoa, so I just reheat some quinoa in a single serving and added the toppings to taste, I'll be having this more often for breakfast!!! After preparing this, I can say wow! This was my first quinoa based dish and I am pleasantly surprised. I am not a breakfast person so it's easy for me to start the day off wrong with sugary, processed food choices. This has helped curve those poor choices and will be a staple in my morning routine. This looks really delish and I plan to make it this weekend! I track all my meals in myfitnesspal.com. I know you have 1/4 of the recipe, but would you happen to know exactly how much does a serving equal?. Is it approximately 3/4 cups, 2/3 cups, 1/2 cups, etc. Thank you! What about using blueberries? Does that work? My family and I just enjoyed a bowl of this, making enough for us to have for breakfast later this week. I have a surfeit of bananas and some coconut milk hanging around that would make a good springtime version of this. Thanks, it was great! amazing! I could have eaten the entire batch myself. That might have defeated the whole eating healthy thing though.Thank you for all your wonderful recipes. I just made this today. It was so delicious! I absolutely loved it! New favorite breakfast, right up there with your chia pudding. Yum. Love quinoa and for those who are not sure….the first time I tried it I was like "seriously you want me to eat 'that'" said emphatically. Now I find myself putting it into EVERYTHING. A must add to turkey burgers – they tend to dry out during cooking and the quinoa absorbs the juices and releases as the meat cools down and for some odd reason have come to love that little pop quinoa has. Nichole in PA.
Ps. Costco has hands down the best price and it's organic which is an added bonus. when you make this do you split the other ingredients between 4 bowls also! i just entered this recipe on the weight watchers recipe builder and it came up at 13 points per serving. How did you come up with 8 points? My family just purchased its first package of quinoa for a recipe, and I was looking for other things to do with it and saw this recipe.. I REALLY like this, and I think my family is going to like it tomorrow when I make it for them! I understand a bit of the bitter taste.. (I dont think I rinsed quite long enough) The great thing is that it is ALL about the mix-ins! as versatile as oatmeal or cream of wheat. Is there anything you know that doesn't work for this? Thanks again. Great Recipe. I increased the water to 2 cups and did it in a rice cooker and it turned out perfectly! A really good recipe! I love quiona this way! Thank you so much! Now that's a power breakfast! Can't wait to try it. Can't wait to try this! Looks good! I would have never thought of quinoa being used like this! Being celiac I'm always looking for new ways to get in good fiber. This is one if the best things I have tried in a very long time. Hearty and so good. I was out of applesauce today and put a spoon of strawberry preserves in it – the base quinoa can be changed up with so many options. Thank you for this great idea! Tried this recipe. Lots of ingredient$$ and prep time for something that taste so BLAND. Right now, the percentage of skinny taste recipes I've tried that are good: 2. Those that are bland/not enough taste: 4. This was amazing, I loved it! My 2 and 4 year olds also ate it! Really want to try this but would like to know….after dividing quinoa between 4 bowls do you then divide the remaining ingredients between the 4 or do they all go into each individual serving? How much quinoa per serving? I donot care for cruncy apples in my oatmeal do you think I can cook my apples with the quinoa? tried this today and it was yummmyyy!!! Hubby and i are trying to go healthy until the end of the year and love the bad for you breakfasts…this is perfect for that craving. Thanks! Made a batch this morning and thought it was great. I mixed all the ingredients together and topped my portion with a little brown sugar. Can't wait to see how it tastes tomorrow morning. To answer the previous question, I bought my quinoa at Trader Joe's but I also saw it in the grocery store near the rice, couscous, etc. You can also order it online if you do a google search. I have not been able to locate quinoa in the store, what area is it in ? with pastas? I cant wait to make this for my 12 month old tomorrow! 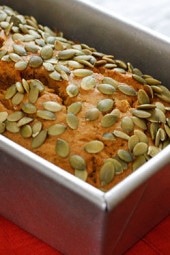 Love the idea of using pumpkin butter too! Oh, I can't wait to try this. We eat quinoa alot, and I have made a breakfast quinoa hash….but this looks delicious!!! I love the spoons, too! I actually boil my quinoa for 10 min and then steam it for 10 min. It makes it fluffier somehow and works great for recipes like this and other quinoa salads. Just thought I'd share. If you have a Costco they so far have the largest and the best price for quinoa. What a fantastic-looking Fall breakfast… or dessert! I love quinoa, and I know this recipe will keep sounding better the colder it gets – thanks for the new idea! I made this last night and brought it to work today. So good! I didn't like quinoa the first two times I tried it in dinner recipes, but this was delish! I think I like it better as a breakfast myself. There are different types of quinoa. Are they all the same or are they different? I usually buy the tricolor quinoa at Trader Joe's and the grains look different size/texture than your picture. Thanks! I made this this morning- very filling, and tasty! Thanks for the recipe- I never would have thought of using quinoa for breakfast! LOVE Quinoa! Incredible recipe, Gina!!! BTW: Trader Joe's has the best price on it that I've found. They even have the multicolored one, which would look awesome in this dish. 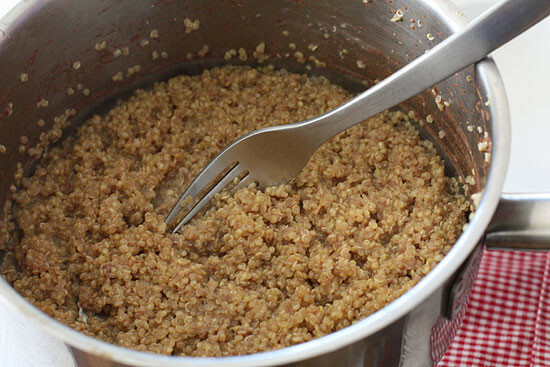 TIP: Making Quinoa in the rice cooker is super easy. You just rinse and cook like rice. Easy Peasy. You've done it again! Man I wish I lived in your house Gina! MMmmm! Quinoa apples pecans and cinammon!? Im in HEAVEN! I LOVE, LOVE, LOVE your website. Everything I've made from here is delicious! Thank you so much for creating recipes that fit my healthy eating lifestyle without all the "no fat=no taste" ingredients. I love how you break down the nutrition facts too! I had this quinoa dish this morning- delicious! Easy to make as oatmeal, but much tastier and filling. This weekend I'm making the Buffalo Turkey burgers with Blue Cheese slaw… Can't wait!! Yum! SOOOO happy you enjoyed it! Yum! Your breakfast looks fantastic!!! I am loving quinoa and it makes a great replacement for oatmeal!! 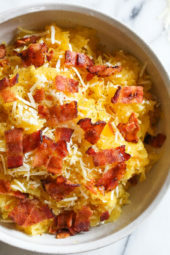 There's a breakfast Quinoa recipe on allrecipes.com that is similar to this one. Also very good. I am super new to cooking, what is the contraption the quinoa is rinsed with in the picture? It looks like a sieve…available at any cooking supply store or at your local Walmart. Hi. Sorry for maybe a stupid question, but as I am reading I'm wondering, when you say to divide quinoa into four bowls, then add toppings, are the amounts for the toppings in the recipe to be divided by four as well? How many points would this be without the applesauce and nuts? To everyone wanting to know if it reheats well, I make something similar with almond milk and raspberries and it reheats beautifully. Just wait and add the milk as you reheat it and it's perfect. I'll definitely be trying this variation very soon. Thanks Gina!! It looks so tasty! And I love your spoon! Has anyone made this and reheated the next day?? this seems like another great recipe to use pumpkin butter with! I'm a little bit crazy with that stuff lately! Love it thanks!! I just made some of that yesterday and I too am in love with it!!! Made the pumpkin pancakes with it last night and oh my!!! This would be awesome with pumpkin! I was planning on making something similar this week since I have some left over quinoa in my fridge! I'll be using almond milk and walnuts instead though. I didn't even think of adding applesauce, what a great idea! I figured it would be a healthier way to sweeten it. Could you freeze it too. How do you think this would reheat if I made a batch the night before and take it to school to reheat for breakfasts throughout the week? Fine, just add the milk and the rest of the ingredients when you are ready to eat. Becky, they are from Such A Time Designs on Etsy! So I just made a double batch of your slow cooker apple sauce and was trying to figure out what to do with it all. I'm going to have to give this a try!